This is a potentially nice and easy dessert recipe I found on Pioneer Woman. The idea is simple: a cup each of sugar, self-raising flour, and fruit cocktail. There seemed to be a lot of things I did wrong on this one. Firstly, I forgot to add to my all-purpose flour some baking powder and salt to turn it into self-raising. I think I also put too much fruit cocktail, because I forgot it’s supposed to only be one cup. 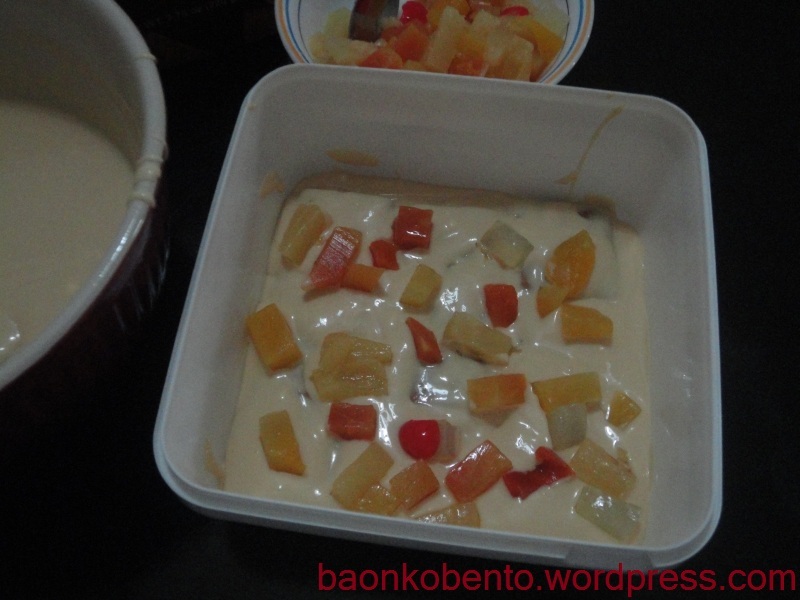 My cake turned out to be too white, and too sweet! As you can see, the cake didn’t rise much and stayed pretty compact. 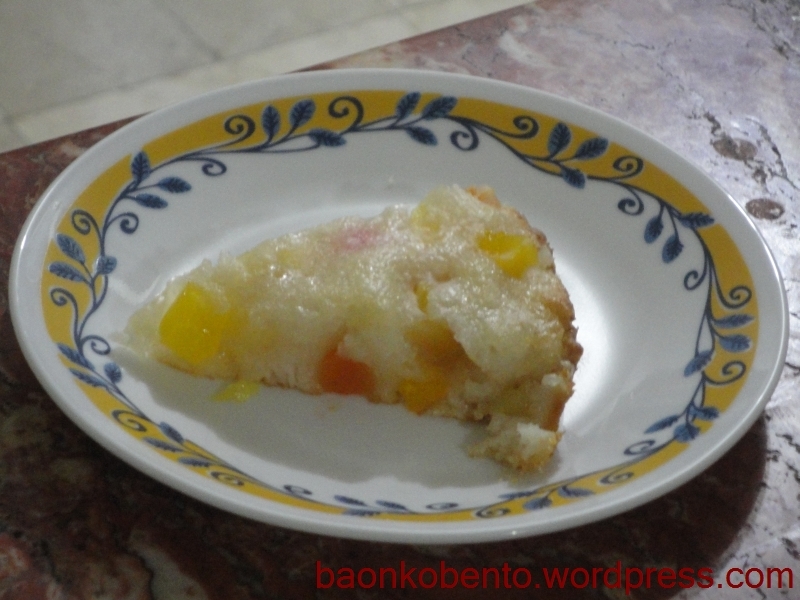 It’s also very sticky, almost like sapin-sapin. I think I’ll try this again next time with the proper measurements. I saw this around the time that Game of Thrones the TV series started. HBO posted this recipe on how to make the lemon cakes that was supposed to have been used in the filming of the series. I thought that it sounded interesting, even though I’m not really a big fan of lemon. 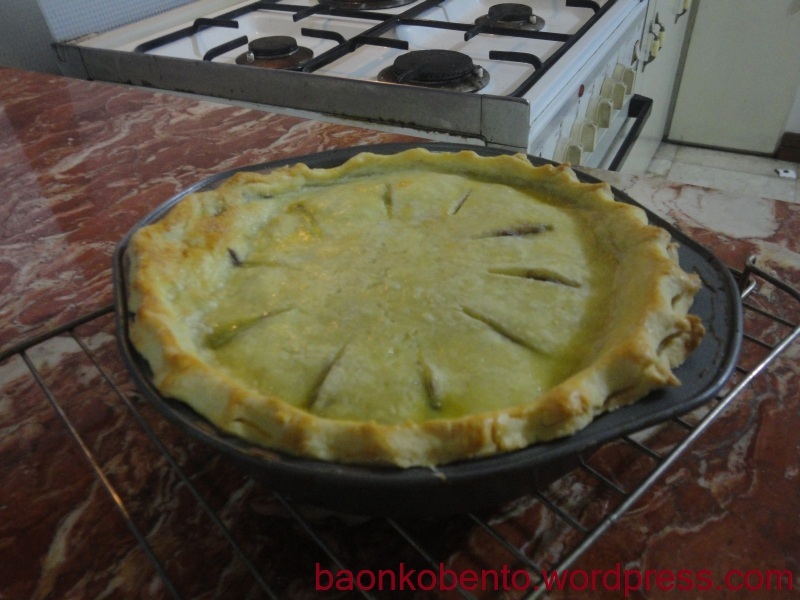 A cooking blog I follow, Learn to Cook, also had a post about her attempt to make this recipe. Last but not least, my mom-in-law just passed down an old casserole that she wasn’t using anymore. All I needed to buy were some ramekins, and I should be set. 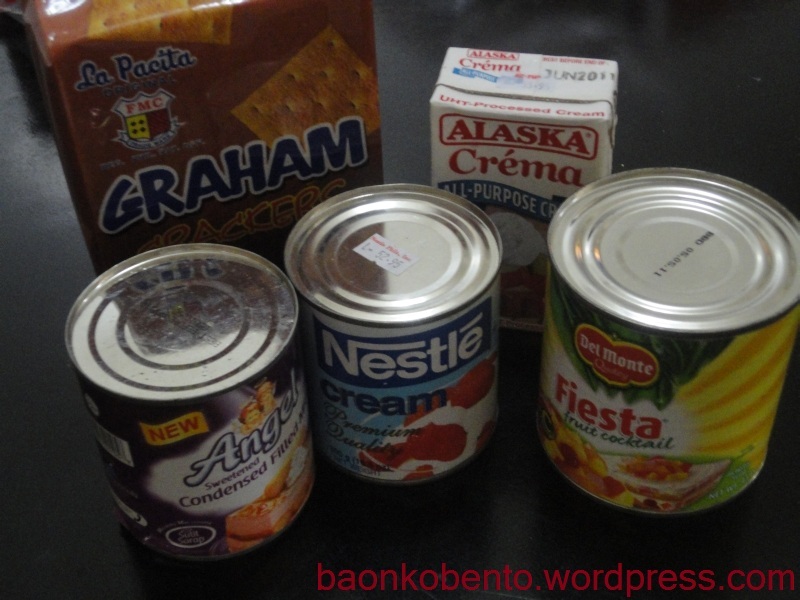 I was able to find some cheap ramekins (Php15 each) at Trinoma. I didn’t know how many would fit in the casserole, so I decided to just buy the whole set of 6. When I got home however, I found that only 3 can fit which meant that I had to halve the recipe. I just followed the recipe instructions until I ended up with three ramekins-worth of batter. 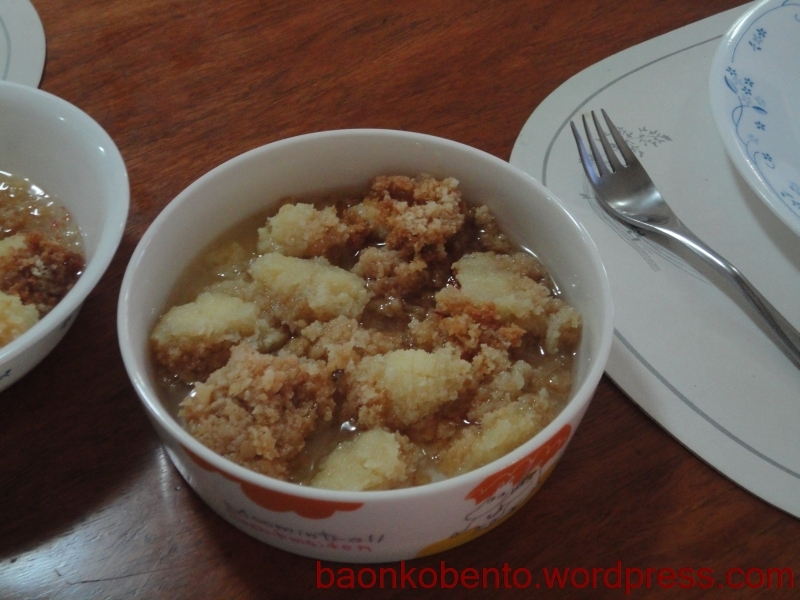 It was my first time to try the bain-marie method of cooking, so I was understandably nervous about the whole thing. 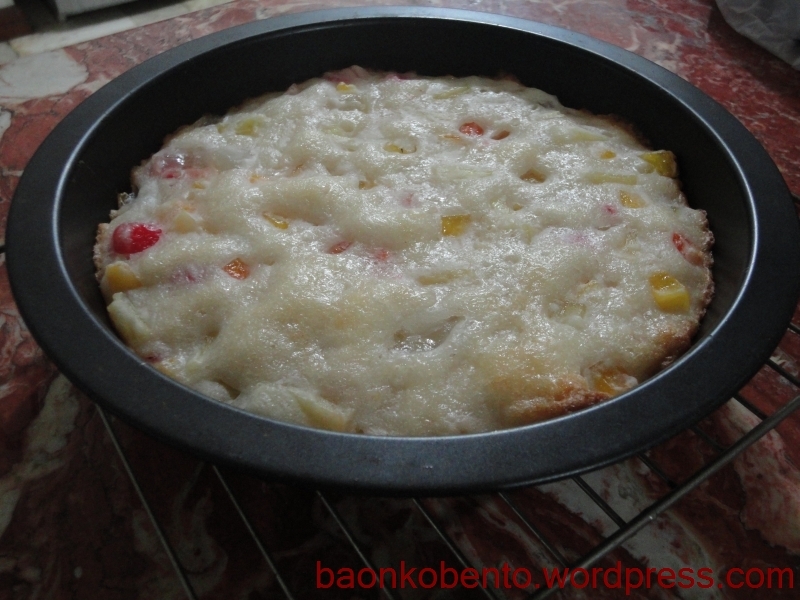 Like Pikko of Learn to Cook, I had to extend the baking time by around 5 minutes to allow the cakes to firm up. That’s how the casserole looked right out of the oven. At this point I was pretty much excited to see how it tastes that I tried all sorts of things to speed up the unmolding. 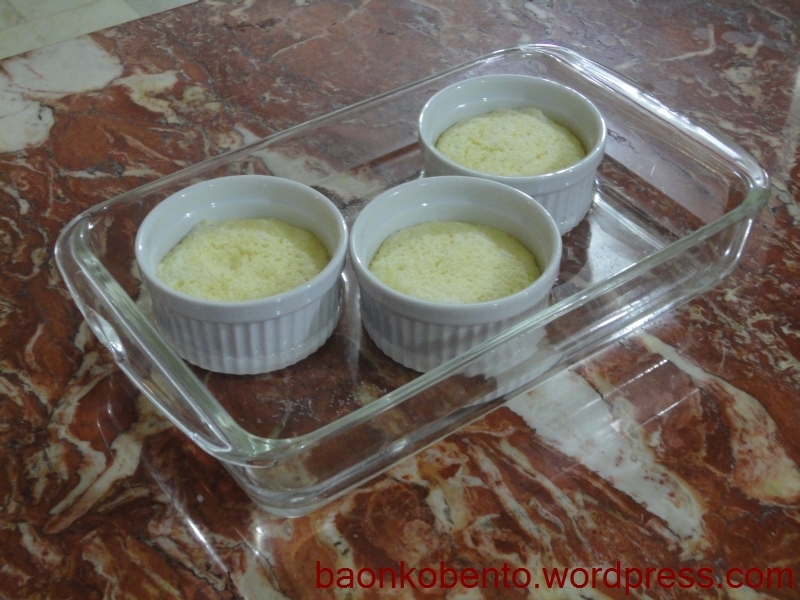 I first held the ramekins in front of an electric fan, but it wasn’t cooling down fast enough for my taste. I ended up just taking a fork and sliding it around the side of the cakes. You could see in the picture below the very uneven edges, which was caused by the fork. You could also see some unevenness on the surface of the cake, which leads me to conclude that I didn’t butter the ramekins enough. How did it taste? 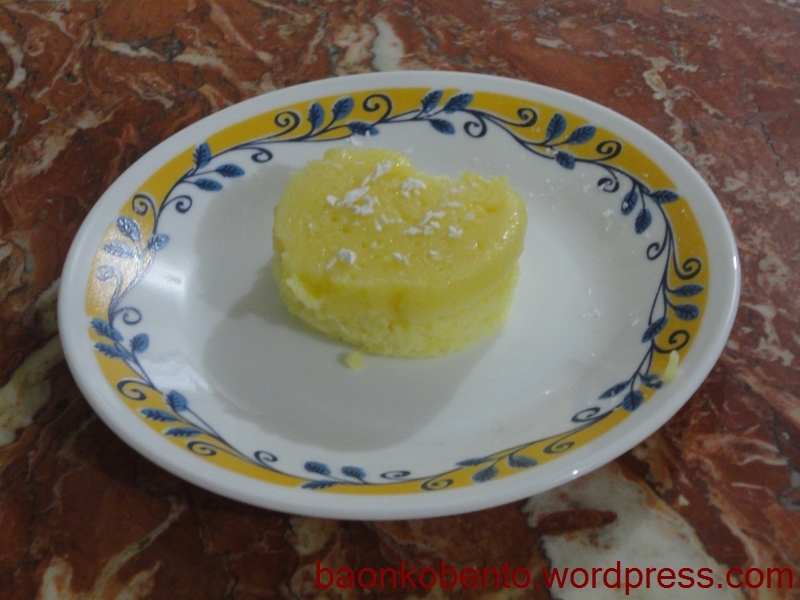 As I said earlier, I am not a huge fan of lemons, but the custard-y feel of the cake made up for it. I found it very delectable! I had The Man try it too, and unlike me, he likes lemons. Even so, he said that the lemon taste was a bit too strong. I should lessen the lemon juice a bit, and it’d be perfect. The three little cakes ended up eaten within 10 minutes of unmolding. Unfortunately the casserole could only fit 3 ramekins. This would be a regular in my kitchen if only I could make more in one go. I might try looking for a larger casserole, or maybe a second one of the same size. It was quite a busy week last week for my family, but thankfully I was able to find the time to sneak in this week’s challenge. I actually had the ingredients ready, I was just waiting for the right time to try it out. I got the recipe from Home Cooking Rocks. Originally, I saved this recipe for the chocolate cream cheese frosting only, but I figured I might as well try out the cupcakes as well. 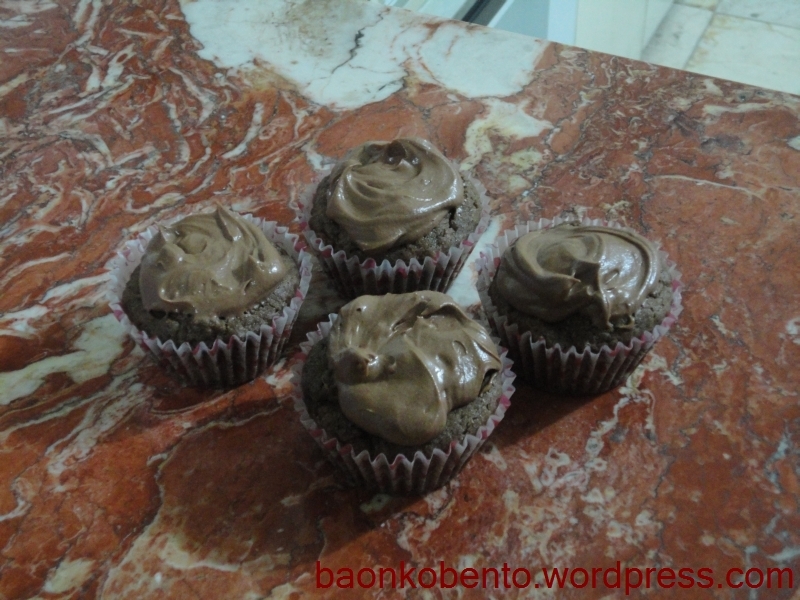 Here, I used Hershey’s cocoa powder for both the cupcake batter and the frosting. It was interesting to see the baking soda fizzle when the vinegar was added. 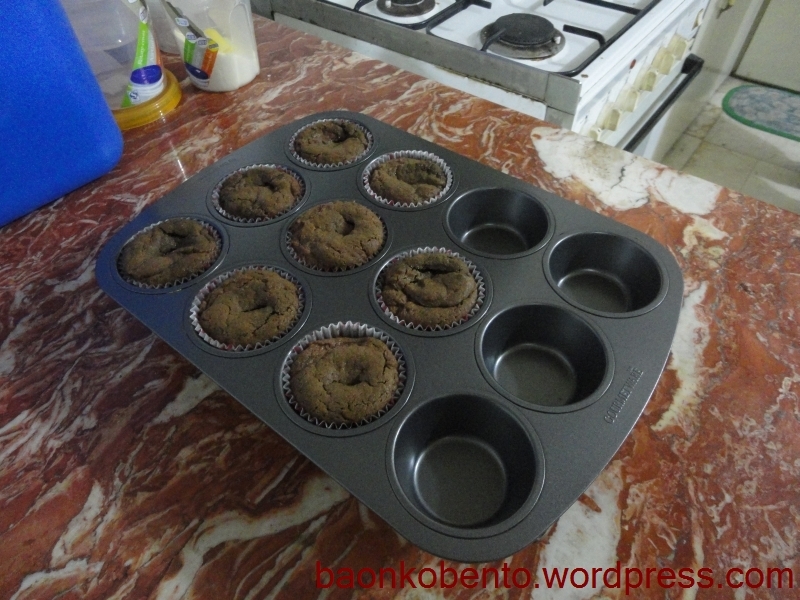 Interestingly enough, the cupcakes kind of sunk after it cooled down. I’m not sure what caused that; perhaps the baking soda? I whipped up the frosting, put it in a temporary piping bag, and frosted swirls on half the cupcakes. Then I got tired of putting it in the piping bag (it was very fiddly! 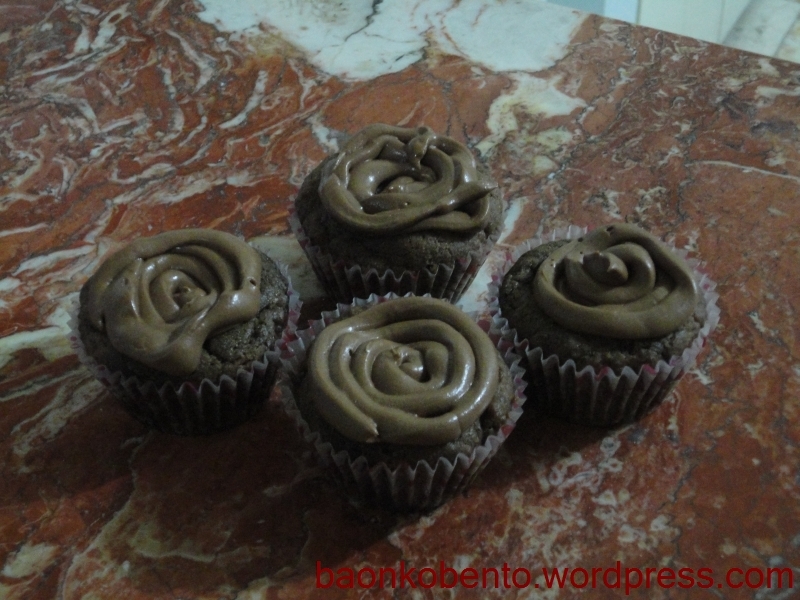 ), so I ended up just spooning the frosting on top of the cupcakes. It’s very chocolate-y! I like how the taste of the cream cheese just come up and surprise you. It was just a little surprising that there was actually very few cupcakes produced. Maybe I’ll try smaller cupcakes next time. 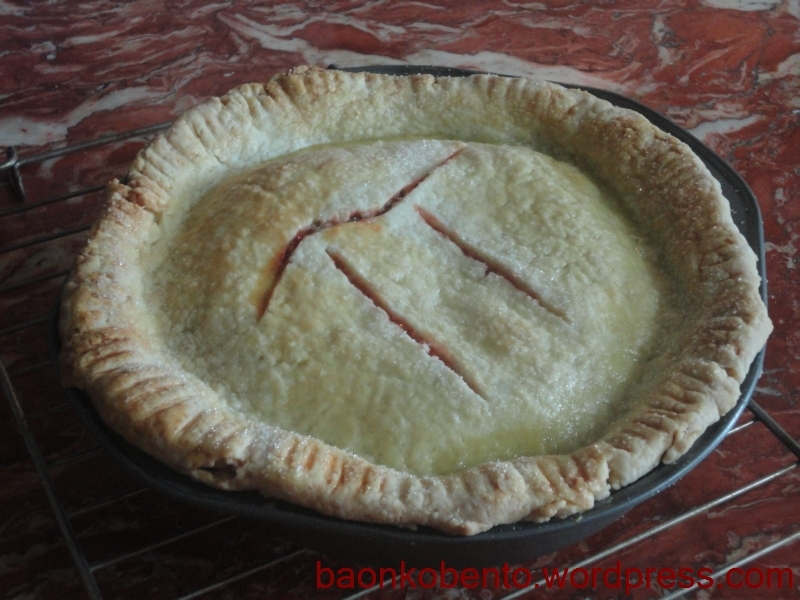 Cherry pie to celebrate the occasion! Lately the gang revisited a really nice Indian restaurant along Buendia Ave named New Bombay (should write a review about that sometime..). One of the highlights of that meal was the dessert: Gulab Jamun. 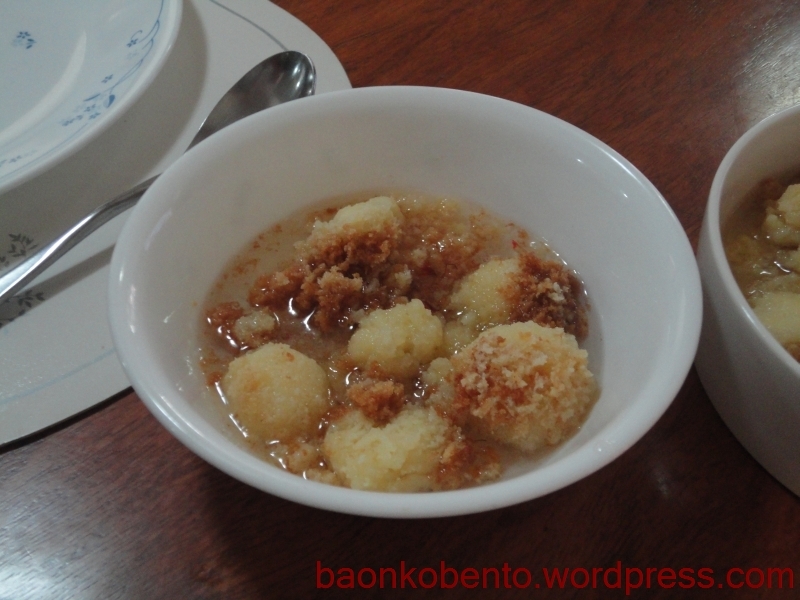 It’s basically deep fried milk balls dunked in flavored sugar syrup. It was so good that I resolved to find out how it was made. I found this really nice and simple recipe from Indian Food Forever, and I had the chance to try it out the other day. The sugar syrup wasn’t hard at all, involving only to dissolve 2 parts sugar to 1 part water, and adding whatever flavorings I happened to have on hand. I used a small amount of saffron (since it’s really expensive!). I tried looking for cardamom pods in several supermarkets but was in vain. It was with the milk balls that I encountered problems. I borrowed my in-laws’ kitchen to make gulab jamun since I can’t deep fry in my own. 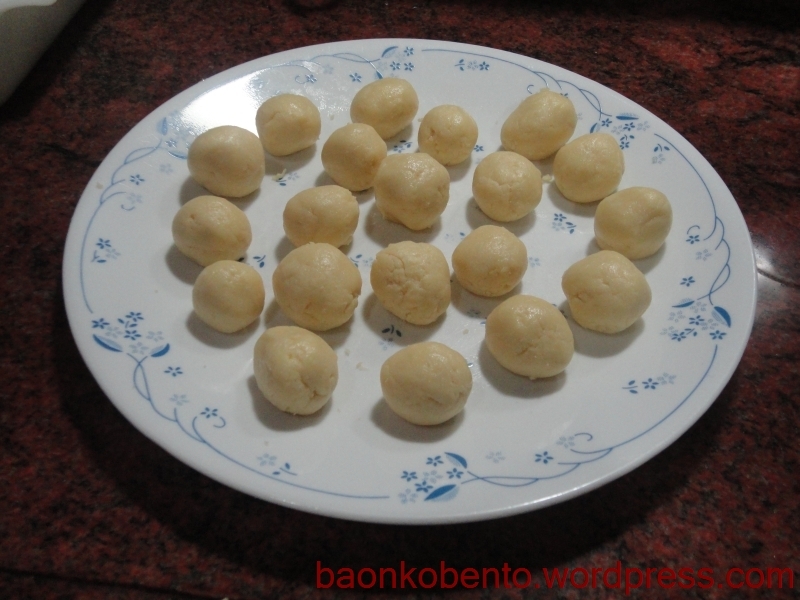 I whipped up the milk mixture and made twenty nice little balls and set them aside on a plate while I heated up the oil. The instruction was to gently slide the balls into the oil from the side of the pan, and gently shake the pan to ensure even browning. And to expect that the balls will float and to shake the pan further. I did all that, but the outer parts of the balls fell apart! Some of the milk mixture came floating in the oil by themselves. I fished them all out with a slotted spoon and set aside in a serving dish. Perhaps the oil was too hot? I transferred to a smaller burner and lowered the heat further, and tried again with another batch of milk balls. Nope, same result. I ran out of milk balls to try with, but had really small fried balls amid a huge batch of fried…crumbs. I put them all on serving plates and poured a generous amount of sugar syrup over them. You can still see the balls in this other picture. How did it taste, though? It actually tasted very similar to New Bombay’s dish, even though it looked very different. The in-laws loved it! It seemed like a great topping to put onto ice cream. Next time though, I’d find a way to make better and more solid milk balls. I’m thinking of pre-baking them before deep frying. I’ve been doing a lot of baking recently, and aside from cookies I’ve also been trying out some pies. 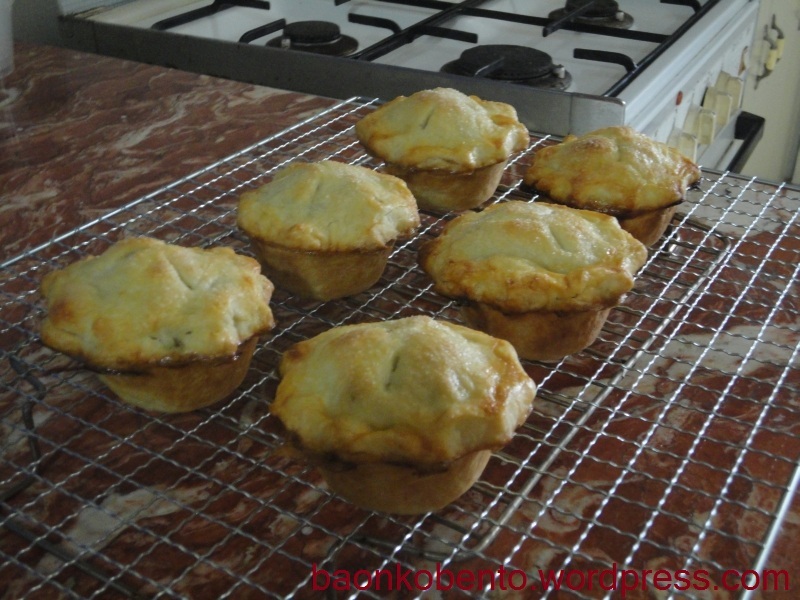 The first one I tried was Apple Mini Pies. It turned out looking rather good, although the crust was quite thick. I need to practice rolling out dough thinner. I decided to try a full-sized pie. While doing groceries earlier I saw some cans of blueberries specifically made for pies. I got a couple of cans and thought I would try making blueberry pie. I borrowed a pie crust recipe from my sister-in-law. Once I perfect this recipe I’ll share it with you. It turned out quite well! 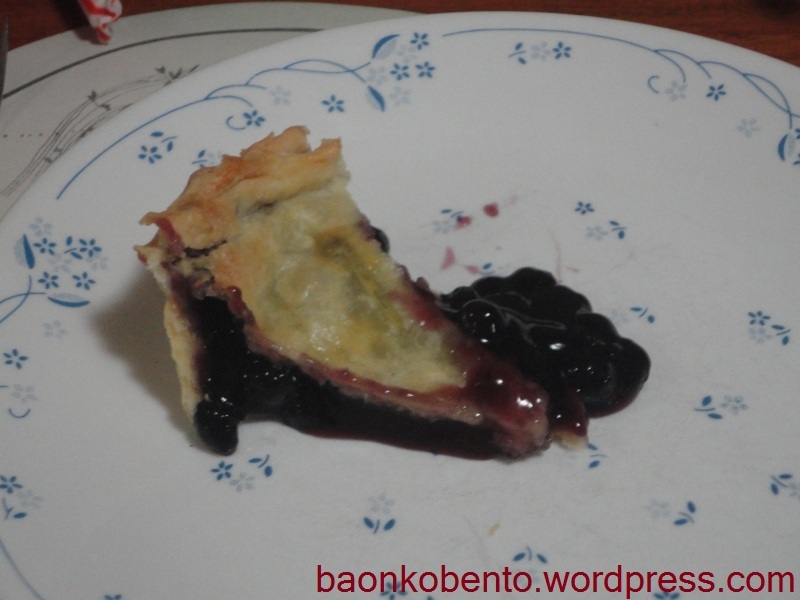 The crust was thin and flaky, and did not interfere with the taste of blueberry. It was plain and simple blueberry pie, and I think it can still be improved. The Christmas season is here! It is the perfect time to whip up a batch of one of the easiest desserts to make: the no-cook ref cake. Here’s my version of the ref cake, using fruit cocktail as topping. 1. 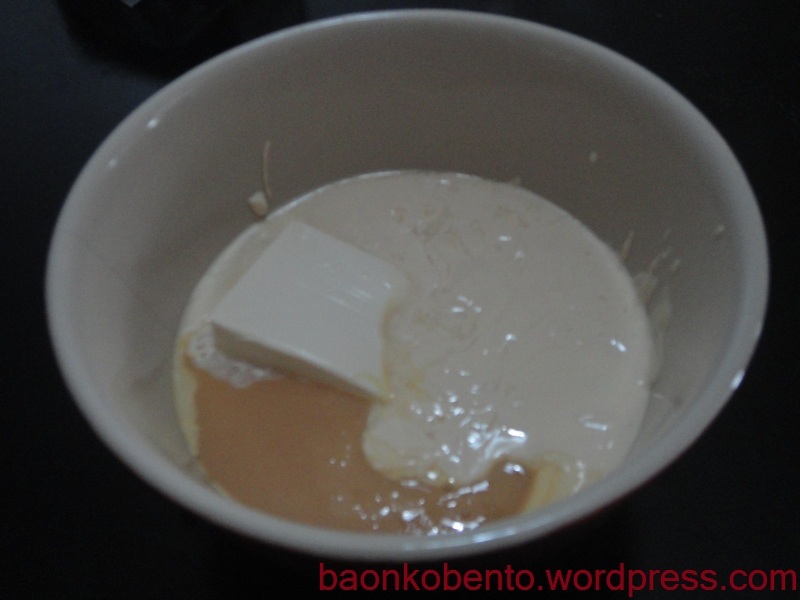 In a bowl, combine all three milk ingredients. 2. 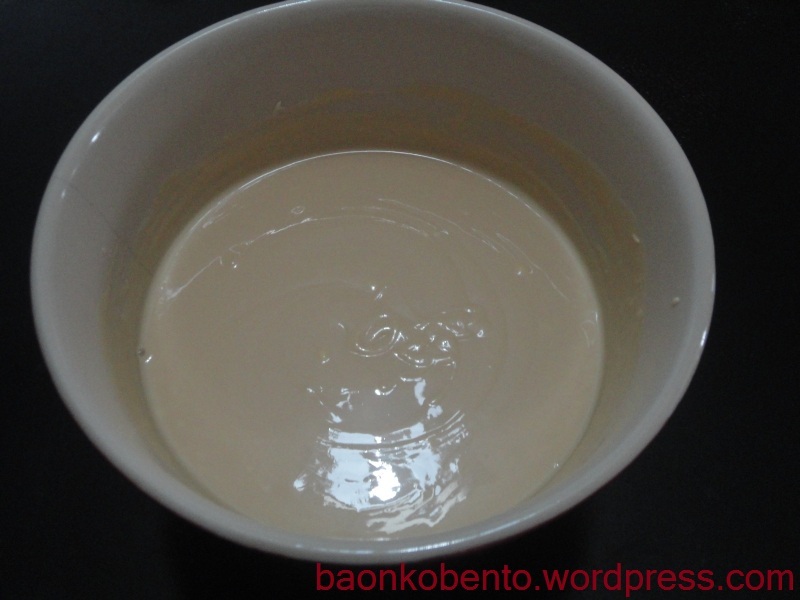 Mix milk ingredients thoroughly with a spoon or whisk until no visible solids remain. 3. Drain the fruit cocktail well and set aside in another bowl. 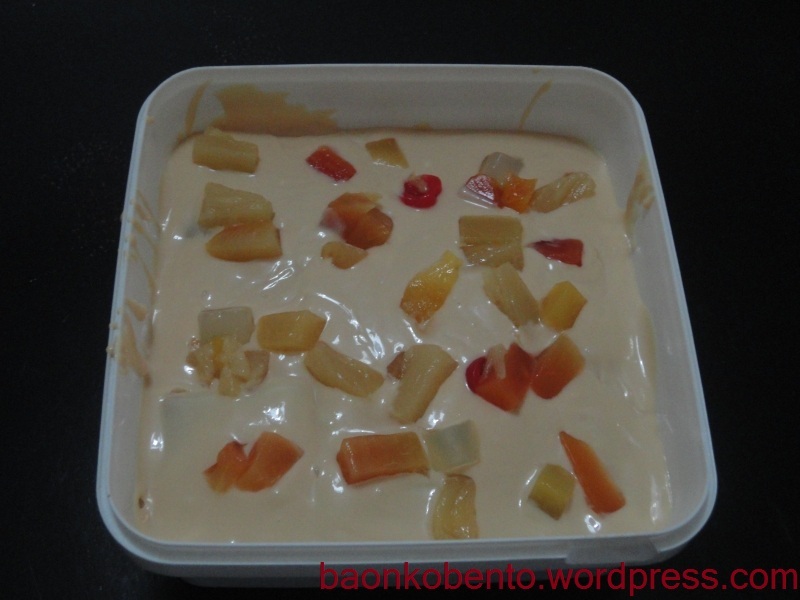 Prepare a container for the ref cake. Here, I am using an old ice cream tub which will hold 9 squares of graham crackers nicely. 4. Start layering. Begin by putting a flat layer of graham crackers on the bottom of the tub. 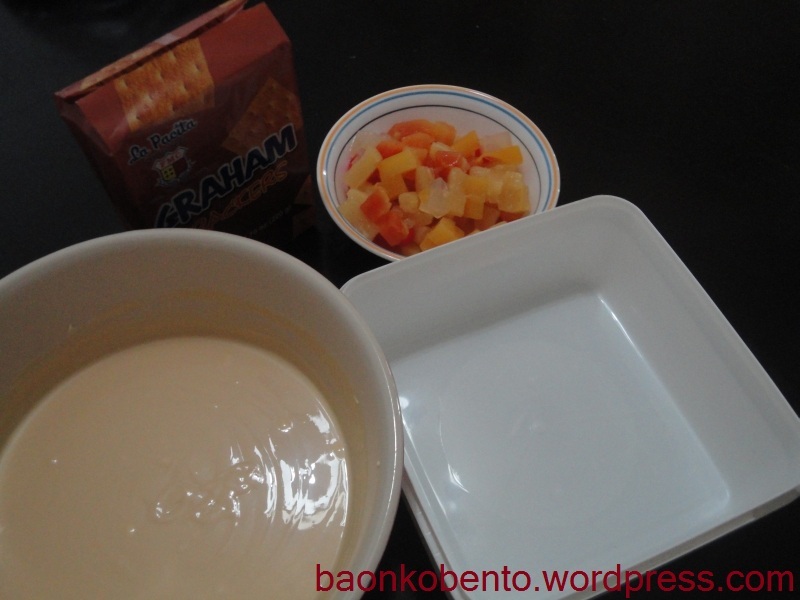 Scoop in spoonfuls of the milk mixture until the layer of graham crackers is fully covered. Make sure that the sides are attended as well. Distribute fruit cocktail onto the milk layer. 5. Continue layering until you run out of milk mixture and fruit cocktail. Try to make sure that you evenly distribute the fruit cocktail among all the layers. In this ice cream tub, I was able to make three layers. 6. Cover and refrigerate for at least 2 hours. I recommend a full 4 hours to make sure that the milk mixture bonds with the graham crackers and create a relatively solid cake. Serve cold. This ref cake recipe is very versatile. You can substitute any topping you like instead of using the small can of fruit cocktail. Standard toppings are in-season fruits like mangoes, peaches, and strawberries, and chocolate derivatives like crushed oreos. I like to prepare a cake (or several) during the Christmas season. It’s perfect for potluck parties or even for giveaways or gifts. And with an estimated cost of around Php170 per cake, you wouldn’t have to be guilty to enjoy it for yourself too.